With more three-dayers down the road, where will you go to explore? 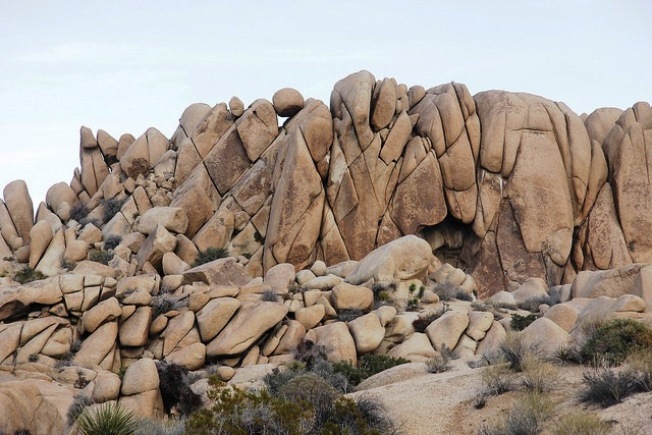 Become one with the boulders of Joshua Tree National Park, or at least admire them from a distance, during your next three-day-weekend break. The National Park Foundation has tips for your trip. OBLIGATED TO THE DESERT: While we all adore the chummy get-togethers of the late fall and holiday season, there is a sense that They Will Happen Each Year, Like Clockwork, and us telling our family that we won't make it this year absolutely wouldn't stand. Our weekends are set in stone, over the last quarter of the year, what with tried-and-true rituals, visits, and gatherings of the celebratory season. But the new year has an open spirit, like the desert has an open spirit; wide vistas spread before us, long weekends without a must-do in sight. Matching that big anything-is-possible-a-tude is a feat best performed in a wide space, like the desert: A wide weekend and a wide setting make ideal partners after a busy, go-go-go, cheerful but cramped season. IN THE SPIRIT OF THE NEW YEAR... and endless possibilities for our weekends, it might be worth stopping your camper along the National Park Foundation's most excellent list of tips for long-weekend-ing it in Joshua Tree National Park. Call Joshua Tree the perfect place to spend Presidents Weekend or Easter Weekend or even Memorial Day; that high desert cool, lemonade-y sunshine, and golden-at-sunset boulders are the exact tonic we need to start fresh in the first half of the year. AND THOSE LONG WEEKEND TIPS INCLUDE... the 18-mile Geology Motor Tour, a look-see of the five oases associated with the park (the famous Oasis of Mara is indeed included), and the wildflowers of Black Rock Canyon which, lo and behold, bloom in springtime, just about the time of all of those delightful three-day weekends. "Desert sunflowers, Indian paintbrush, and wild hyacinth" are noted for their hues, as are the cacti that produce their iconic, full-petaled, waxy-nice buds come the warmer days of spring. For sure, our lives are all different, whether we were over-obligated around the holidays or not. But everyone has hope for an adventurous new year, and, for most people the calendar come January is a bit freer than it was during the previous month. You can make this boulder-filled national park for a long weekend, you can, and find an actual oasis or two in which to find some needed space.